The Short Version: The Electronic Privacy Information Center, or EPIC, is a public interest research center that focuses primarily on emerging online privacy and security issues. With the number of online dating profiles, social media pages, and security threats on the internet, EPIC understands the importance of providing users with the resources they need to stay informed and make important online changes. The Center works with a distinguished advisory board and law experts on areas of technology and public policy while also offering public education programs. EPIC routinely organizes conferences for NGOs and pursues open government privacy cases. All of this is done to protect us against online threats and inform us about how our information is used. Our connected world could not exist without the internet. Between Facebook pages, Twitter accounts, and online dating profiles, we use tons of platforms to interact with people online every day. And many of us have a variety of these personal profiles, which means our data is subject to different user agreements, policies, and risks. It’s important to maintain an awareness of how our information gets used and how we can protect our online privacy. 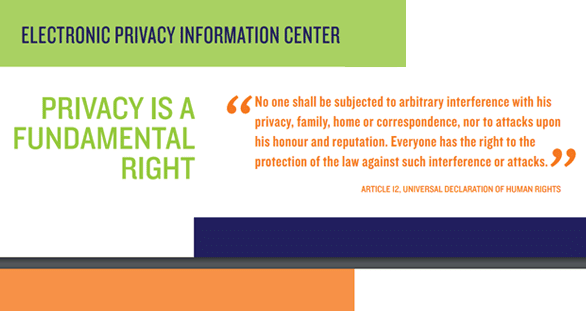 The Electronic Privacy Information Center (EPIC) is a public interest resource center dedicated to protecting consumer privacy on the internet. The organization frequently acts as an advocate for consumers by becoming involved in everything from federal court cases associated with data breaches, to speaking before Congress and judicial organizations regarding privacy and civil liberties issues. Having an advocate like EPIC is becoming increasingly important as more of our information gets shared online. None of us want our data being used for things we didn’t sign up for, but, unfortunately, this happens all of the time, and the results of shared information can threaten our safety in many different ways. EPIC is one of the most popular privacy websites in the world and is always working toward goals like protecting women from online threats and keeping social networks honest about the data they collect from us. This is all done to keep sensitive information safe. In many ways, technology gives us freedom, but certain technologies are frequently used for nefarious purposes. Specifically, gender targeting has become a major concern. Men and women are both at risk, but women are disproportionately targeted online and are quite often sexually objectified. Two problems EPIC has particularly focused on in the area of cyberstalking are video voyeurism and pretexting. Video voyeurism is a practice fueled by inexpensive, tiny cameras used to take photographs or videos of women’s private areas in public. EPIC was a leader in the fight against it, and in 2004, the Video Voyeurism Prevention Act was passed by Congress, making the practice illegal. 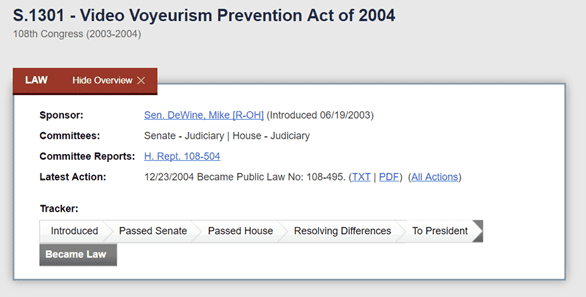 EPIC’s fight for privacy rights helped lead to the Video Voyeurism Prevention Act of 2004. Another type of behavior that is meant to expose personal information is pretexting, which is when information is collected about a person under false pretenses. Perpetrators prey on family members by luring them into thinking the relative in question is about to receive a sweepstakes payment or an insurance award. This can often lead to the disclosure of sensitive information, which, in turn, can put that relative in danger. EPIC not only brings awareness to issues like these, but they work tirelessly to get bills passed and shape policies aimed at targeting folks who pretext or use technology in ways that objectify women. This helps to protect women from threats like cyberstalking, video voyeurism, and, in some cases, actual in-person threats. Social media sites like Facebook are great ways to connect with friends and loved ones and to learn about shared interests, but many social media users worry about the safety of their personal information. Facebook, in particular, has made a practice of sharing user information with third-party vendors, enabling cookies on the site, and many other tactics that threaten the security of user information. The primary concern of many users is the lack of transparency about how their information gets shared and who it’s shared with. Most users are unaware of what the fine print says in the user agreements on social media sites, but EPIC keeps excellent track of these policies. EPIC was founded on the belief that privacy is a basic human right and should be defended that way. They offer users updates and resources to determine just how and where information is compromised to let users decide what information they want to share and what privacy settings should look like. EPIC serves not only as an advocate for these types of privacy issues when it comes to dealing with the Federal Trade Commission (FTC), but they also provide users with resources, news articles, and necessary information to keep them informed. By having EPIC as a resource, social media users can access a wealth of information to make informed decisions about what they want to share and make public. EPIC continuously works to do everything they can to set new bills and policies in motion. Privacy is a big concern, but EPIC is aware that there are other threats to personal information on the internet. Online consumers are frequently victims of cyber threats in the form of spyware like computer viruses, malware, worms, and fraudulent products or services. Identity theft, spam, phishing scams, and pharming attacks are all too common, making it very challenging for consumers to trust companies that provide certain products or services online. EPIC has been involved in some significant cases and initiatives involving privacy and cybersecurity. EPIC is an advocate for policies aimed at keeping these internet users safe against hacks and attacks. Because of the ever-evolving nature of these threats, government policies intended to address them are continually being developed, and EPIC remains on the front lines by doing everything they can to help push them through. While it’s up to the user to stay informed regarding online threats, by utilizing EPIC as a resource, they can learn just what these threats are — and how to avoid them. Through EPIC, online consumers have access to reports, papers, and articles about these security initiatives. EPIC also makes use of the Freedom of Information Act (FOIA) to obtain government information about privacy policies and surveillance laws. EPIC works hard to enhance cybersecurity and wants to be straightforward about how consumers can protect themselves. Living and participating in the digital age means we’re all possible victims of cybersecurity threats, but as one of the biggest online privacy websites in the world, EPIC actively pursues emerging civil liberty issues. They work in close collaboration with an advisory board and legal experts in public policy so they can speak before Congress and judicial organizations about these developing issues. EPIC is always keeping an eye out for new and emerging technology that could pose a threat to online consumers. They empower us to stay informed about our rights in situations where we may have been victims, what we can do to stay safe online, and how to understand the fine print on social media and dating websites. 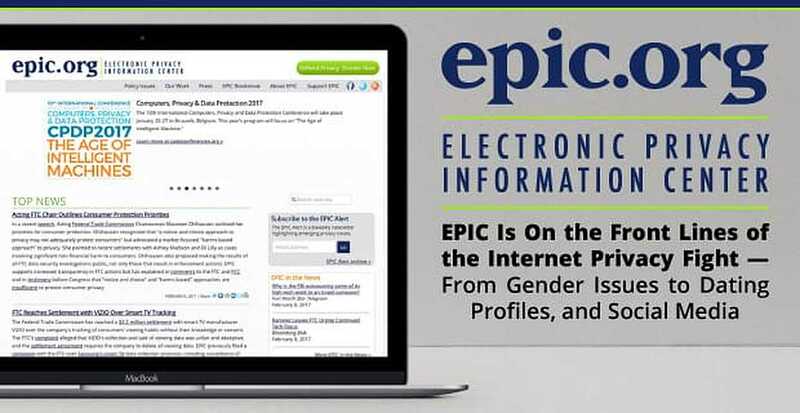 By utilizing EPIC’s comprehensive database to stay informed, we can remain continuously aware of what we can do to protect ourselves when it comes to avoiding issues like gender targeting and using dating profiles and social media sites. EPIC continues to be at the front of the internet privacy fight to keep us in control of our personal data. This way, we can continue to use the sites we love — and have come to rely on — without worrying about what we might be compromising.